My husband is a bit of a burger connoisseur. Whether it’s from a fine dining restaurant, diner, fast food, or homemade, he likes to try them all. Hence, during our trip to New York, I was excited to introduce him to Shake Shack, especially their flagship Madison Park location, a mecca for burger aficionados. We headed to the park after checking into our hotel given it was a short walk away. However, after waiting 15 minutes and getting halfway through the line, only to see the mayhem that ensues at the pick-up window, we decided to abort the mission. Apparently, for my burger loving husband, if it requires waiting and shoving for, it’s not worth it. By this time, we were craving burgers - we had stared at a menu long enough. Luckily, just down the street from Madison Park (on 23rd) sat Schnipper, a large bright cheery diner that reminds me of a spacious Johnny Rockets. 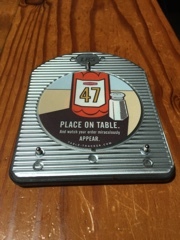 After ordering, you’re given a large metal coaster and advised to sit anywhere in the dining room. Traditionally, these devices start flashing when your table’s ready and guests make their way back to the hostess stand. At Schnippers, it’s a tracking device so our server knew exactly where to bring the food – quite an ingenious system. Their regular hamburger ($6.50) was good, but admittedly no Shake Shack. Nonetheless, it still hit the spot and tasted extra delicious since it didn’t require waiting in line for … I’m getting too old for lines. The beef patty was thick enough so you could savour the flavours amongst everything else. 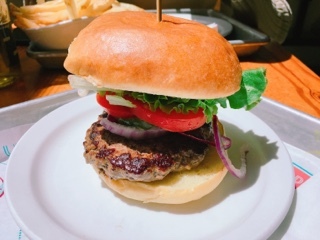 Classically adorned with lettuce, onion, tomato and a pickle, the toppings were fresh and went nicely with the soft toasted bun. The Schnipp ($7.50) was better and true to the menu’s description was “extra-juicy”. 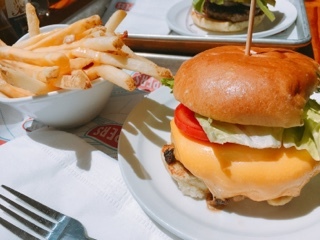 However, I feel it has less to do with a different meat mixture or it using double the cheese, rather it was simply actually cooked to medium, whereas my regular burger was cooked through (despite requesting medium). You need to dig to the bottom to get the really sauce-drenched cheese fries ($4.50). 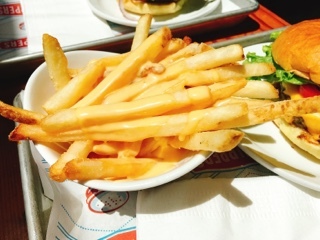 The sauce has a fairly strong cheddar kick to it, but the fries neutral with little potato flavours. Imagine slightly thicker McDonald’s fries with a thick creamy cheese sauce and that’s what Schnipper’s is serving. Once again, the fries were satisfactory but didn’t leave me groaning like Crack Shack’s. Even so, where it lacked in flavours, Schnippers made up with speed, service, and the comfortable air-conditioned dining environment. Lounging or lines? Schnippers may be a good Madison Park Shake Shack alternative for you as well.